CHANGSHA: The fifth Cross-Straits Economic, Trade and Culture Forum kicked off in Changsha, capital of central Hunan Province, on Saturday. Wu Poh-hsiung, chairman of the Kuomintang (KMT) party, said at the opening of the forum that communications, exchanges and integration on the cultural platform play a key role in making further and substantial breakthroughs in mainland-Taiwan relations. The forum, which focuses on promoting and deepening cross-Straits cultural and educational communications and cooperation, is of historic and practical significance, Wu said. Wu also called for an expansion of communication and cooperation between the mainland and Taiwan and urged people on both sides to cherish the hard-won achievements made in cross-Straits relations. He urged efforts to work for the welfare and interests of people on both sides and called for new impetus to drive forward the development of cross-Straits relations. Jia Qinglin, chairman of the National Committee of the Chinese People's Political Consultative Conference, delivered a speech at the opening ceremony, in which he underlined the importance of Chinese cultural inheritance and complementary collaboration of cultural industries between the mainland and Taiwan. The development of cross-Straits relations have offered the two sides a better environment to expand cultural and educational cooperation, Jia said. He called on people on both sides to promote the peaceful development of cross-Straits relations and contribute to the rejuvenation of the Chinese nation. Jia said the two sides should maintain their shared Chinese cultural inheritance, cement spiritual ties, strengthen their sense of identity to the Chinese nation, and work together to promote the international influence of the Chinese culture. Jia hailed the forum as an important platform for the Communist Party of China (CPC) and KMT to have dialogues, where top leaders of the two parties can express their views. But communications and cooperation in the cultural and educational sectors have lagged behind of that of economic sectors and misunderstandings still exist between people on both sides, said Jia. Wang Yi, director of the CPC Central Committee Taiwan Work Office, said the forum conforms to the development trend of cross-Straits relations. 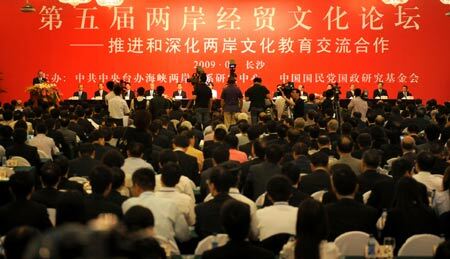 About 530 politicians, businessmen, experts in culture and education sectors participated in the two-day forum, including about 270 from Taiwan.